Aquatic organisms are rich in antimicrobial peptides which play key role against pathogens during infections. 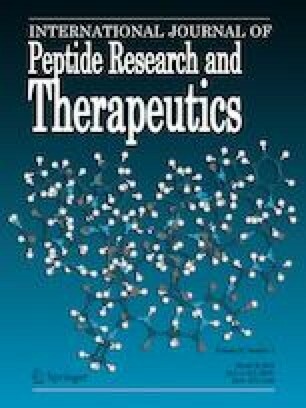 Cathepsin is one of immune proteases which have been proven with multiple functions including antimicrobial activity, but their role as antimicrobial peptides has not been elucidated so far in aquatic organisms. This study reports the identification and characterization of antimicrobial peptides from fish cathepsin D. Channa striatus (Cs) cathepsin D (Cath D) was identified from its established cDNA library. Multiple sequence alignment was performed to analyze the homology of CsCathD with other cathepsin. Based on the amino acid propensity scale, two putative antimicrobial regions were identified, synthesized and analyzed for their antimicrobial potency. Gene expression of CsCath D and its mRNA pattern upon pathogenic infection was also observed using real time PCR. All the bioinformatics analysis indicated the gene specific characteristic features of CsCath D. CsCathD mRNA expression was highly expressed at 24 h for bacteria (Aeromonas hydrophila) and 48 h for fungus (Aphanomyces invadans). The CsCath D derived CAPs namely, PL12 and NM12 showed their commendable inhibition towards Bacillus mycoides of the tested bacteria. The cell membrane disruption was observed with PL12 against B. mycoides in flow cytometer. With all proceedings, it is possible to conclude that CsCathD might be a potent immuno modulator and the reported CAPs could be developed as therapeutic agents to treat bacterial pathogenic infections. The online version of this article ( https://doi.org/10.1007/s10989-017-9652-y) contains supplementary material, which is available to authorized users. This research is supported by Department of Biotechnology (DBT), Ministry of Science and Technology, Government of India, New Delhi through DBT’s Prestigious Ramalingaswami Re-entry Fellowship (BT/RLF/Re-entry/27/2011). The corresponding author is grateful to the Deanship of Scientific Research, King Saud University for partial funding through Vice Deanship of Scientific Research Chairs. Also, the corresponding author would like to acknowledge Universiti Putra Malaysia, Malaysia for providing him visiting professor award (UPM/PEND/500-3/4/10) to complete this study under the HICoE Program, Ministry of Higher Education Malaysia. This study was funded by Department of Biotechnology (BT/RLF/Re-entry/27/2011), Ministry of Science and Technology, Government of India, New Delhi; Deanship of Scientific Research, King Saud University and Universiti Putra Malaysia (UPM/PEND/500-3/4/10). Akila Sathyamoorthi, Venkatesh Kumaresan, Rajesh Palanisamy, Mukesh Pasupuleti, Mariadhas Valan Arasu, Naif Abdullah Al-Dhabi, Kasi Marimuthu, S. M. Nurul Amin, Aziz Arshad, Fatimah Md. Yusoff and Jesu Arockiaraj declare that they have no conflict of interest. All applicable international, national, and/or institutional guidelines for the care and use of animals were followed. All procedures performed in studies involving human participants were in accordance with the ethical standards of the institutional [SRM University (361/IEC/2012) and CSIR-CDRI, Lucknow (CDRI/IEC/2014/A1)] and/or national research committee and with the 1964 Helsinki declaration and its later amendments or comparable ethical standards.